During Sept of 1980, the Parish Council, on behalf of the Church Community, purchased 2.25 acres of land, just south of and adjacent to St. Matthew's high School, as the future site for our Church. In the summer of 1981, Father Michael celebrated a Mass on the grounds of what was soon to become our meeting place of worship. It was a small group of dedicated people that trudged through the mud and long grass to where hopefully the new church would later be built. A makeshift sign was erected to mark the site of the future Church. In Sept 1981, it became necessary to relocate the celebration of Mass to St. Matthew's to meet the needs of our growing community. During May of 1982, the Church Building Committee was established to plan the building of a church to meet our immediate and long term needs. Because of the generosity of our parishioners, the final mortgage payment on the land was made in Sept 1982. 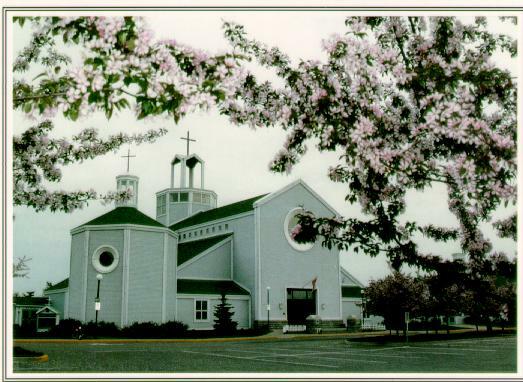 On March 20, 1983 Archbishop Plourde established the new Parish of the Divine Infant incorporating the same boundaries as that which existed for St. Joseph's Parish of Orleans. Father Michael was appointed Pastor of the parish, which now comprised over 1200 Roman Catholic Families. At LeBreton Flats, on Sept 20, 1984, Pope John Paul II blessed the cornerstone of our Church. On Sept 29, 1985, Bishop John Beahen officiated and con-celebrated with the Parish at the groundbreaking ceremony on the building site. Just before Christmas 1986 the Church was officially transferred to the Parish and the first Mass was celebrated within our new building on Saturday December 20, 1986. Still growing quickly, Divine Infant has increased its size tenfold now looking at some 12, 000 people even after considering the realignment of the south-western part of our original Parish boundaries which now has been realigned as part of Good Shepherd Parish in Blackburn Hamlet. Our founding Pastor, Father Michael Hurtubise, was ordained a priest Jun 10, 1957 at St. Patrick's Church, Ottawa, and then served as choir master of Notre Dame Basilica, where he was in charge of music for the Archdiocese of Ottawa. He also served as chaplain to the Grace Hospital and the Children's Hospital of Eastern Ontario. He served many parishes in the archdiocese as associate Pastor until appointed as Pastor of Our Lady of Perpetual help in Ottawa. He then left to become our Pastor here at Divine Infant in 1981 and served his flock well until his retirement to Clayton, Ontario in 1987. Father Michael passed away on May 27, 1991 in his 60th year. He is interred at Notre Dame Cemetery, Ottawa. Msgr. 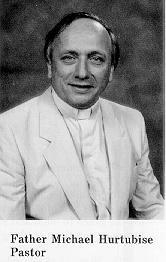 Len Lunney became our next Pastor in 1987. Msgr. Lunney was born in Pakenham, Ontario. He was ordained a priest for the Archdiocese of Ottawa in 1959. He was appointed to work in the field of secondary education at that time, and was a high school principal for fifteen years at St. Pius X High School, Ottawa, and at St. Matthew's High School, Orleans, Ont. He holds a Master's Degree in Educational Administration. In 1996, he was honoured by Pope John Paul II with the title of Prelate of Honour. He was also the chaplain for the Fire Department and was the chaplain of Council 7873 of the Knights of Columbus. He also served as chaplain of many other parish organizations. A tireless worker and much beloved by his flock, he led by example and coped admirably with fulfilling the duties at one of the largest Catholic Parishes in Canada, notwithstanding having only a few permanent staff assigned to him. He always praised the generosity of the volunteers who gave so much of their time to assist him in making Divine Infant a loving and growing community. When not busy at his pastoral duties, he could be found tinkering with one of his vintage automobiles or playing the piano or singing at one of the numerous parish gatherings at which he was famous for pulling out his guitar and entertaining children and adults alike. We were indeed fortunate to have been blessed with having a Pastor of his capabilities. His genuine love for the people was reciprocated by all who came to know him. He became the Episcopal Vicar for the english sector of the Archdiocese of Ottawa in Sept of 2001 and is now retired. Deacon Moran McMahon (now retired as Deacon of Divine Infant Parish) was ordained a Permanent Deacon on Jun 15, 1990 at Notre Dame Basilica Cathedral by Archbishop Marcel Gervais. He was assigned to Divine Infant parish in Aug of the same year. Moran received an honours Bachelor of Theology degree from Saint Paul University in 1994.He is currently on a leave of absence from the Masters and Licentiate program in Canon Law at Saint Paul University.Prior to being ordained a Permanent Deacon, he spent 14 years with the Canadian Armed Forces as an Aerospace Engineer and 17 years with the Treasury Board as a specialist in Management Engineering. He also has a Bsc degree, a MA degree in Public Administration and three years of Chemical Engineering. Present interests include reading, (mainly theology), ham radio, and amateur Enology, that is, making wine.He is currently taking a course at Algonquin College leading to a Sommelier certificate, (wine and food consultant). Married to Doreen (nee Smith) born in North Shields, Northumberland, England.they have just celebrated their 45th wedding anniversary. The McMahons were blessed with four children (one passed away Dec. 3/85). We thank Moran for his tireless work on behalf of Divine Infant.When you see him at Mass now, please give him a warm smile and a big thank-you for all the work he has done. Deacon Al Ritchie was ordained a permanent Deacon Jun 25, 1999 at Divine Infant Church by Archbishop Michael Gervais. He was assigned to serve Divine Infant Parish begining in Aug of the same year. Al was born and raised in Montreal and became a Catholic at age eighteen. Al attended St. Francis Xavier University where he graduated with a BSc in 1963. Prior to his retirement in 1991, Al's career was spent in management, systems and computing. He spent his last eleven years as department head at Laurentian University in Sudbury. Widowed in 1970, Al learned to cope with the loss.